Thanksgiving is one of my favorite holidays of the year. I think that this is mostly because it's all about the food. Yes, I'm thankful for all the blessings in my life. But I am always thankful when it's time to dig into my plate of food as well. Remember how I told you that food makes me feel closer to home? Thanksgiving is definitely one of these times. I love the holiday season in general. I love the food; I love the songs and the decorations. And the longer I live abroad the more important this time of year becomes. And now that we're a family of 3 and not just 2 anymore, this changes the whole ballgame. Now I want my son to understand what the holidays are all about as well. I love sharing Thanksgiving with people of all nationalities. Thanksgiving seems to be mostly a North American holiday (celebrated by Americans and Canadians). But I think that having a holiday that's all about giving thanks to God is just something too great to pass on the opportunity of sharing it with others. It is interesting, however, to try explain what Thanksgiving is all about to those who have never heard of it before. They usually understand the idea although, perhaps, they may not like the food that much. One year I made an entire Thanksgiving meal for some Egyptians, and as an afterthought I made a lasagna as a second meat (it's usually customary to have 2 types of meat at a meal here). But there are lots of people, Egyptians or not, who really enjoy Thanksgiving as it is. I have realized that celebrating the holidays while living abroad is all about what YOU decide you want to celebrate and how you want to celebrate it. If I waited for someone else to make Thanksgiving special for me, then I might miss out on one of my absolute favorite meals of the year. So I do it myself - if I can. And I share it with others too. Putting together a Thanksgiving meal is kind of like creating a work of art. My grandfather was an artist, and I always say that cooking makes me an artist at heart as well. Turkey. 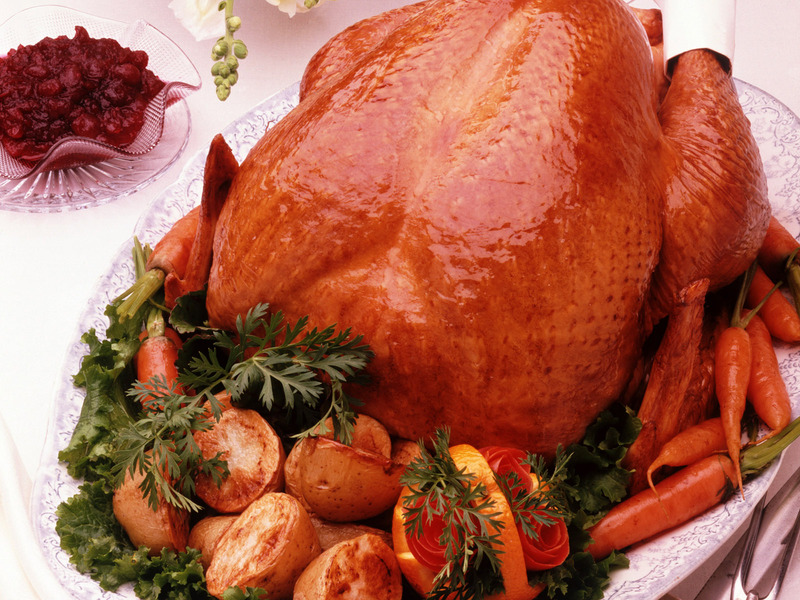 Turkey is central to the whole Thanksgiving meal. But I do believe in keeping my turkey as simple as possible. So my one tried and true recipe for roasted turkey is an easy herb rub mixed with olive oil. Turkeys are fairly common in Egypt, although finding a large, plump bird can be a little challenging. But when I ask my husband to bring me a turkey, he always manages to find me one. He's my hero. Stuffing. Can't have turkey without stuffing! In past years, I have taken it easy and brought stuffing mix home from the USA for Thanksgiving. This last time home, however, I completely forgot to buy it so it will have to be the homemade version this year. Stuffing is pretty easy to make. Actually the hardest ingredient to find in Egypt is surprising - it's celery. Local celery is available in Egypt, but it's small and doesn't have big stalks like the celery in the States. Big celery is available from time to time but not always. I sure hope we can find it this year. Mashed potatoes. Love 'em or hate 'em, you can't have Thanksgiving without them. Potatoes, butter, and milk... all available in Egypt. At last, something easy here. Turkey gravy. Thanksgiving is the one time of year when I put gravy on my mashed potatoes. I never realized until recently how simple it was to make turkey gravy. All it takes is a little turkey drippings, flour and some chicken stock. Voila! The only thing I hate about this is having to wait until the very last moment to make it. Oh, well. Sweet potato casserole. I grew up eating yams and marshmallows every Thanksgiving. But a few years ago, I tried a sweet potato casserole recipe on a whim. Pureed sweet potatoes topped with a brown sugar pecan crust. All I can say is YUM! Luckily sweet potatoes are easy to find in Egypt. The problem ingredient actually is pecans. I have seen imported pecans here a couple of times, but usually I bring my pecans back from the States. We'll see what will happen this year because I don't hav any in my freezer right now. Corn casserole. We never ate anything like corn casserole when I was growing up. And I honestly can't tell you how or why I started making a corn casserole every year. This is basically a simple concoction of canned sweet corn, shredded cheddar, diced onion, and my own secret cream of mushroom soup substitute topped with a butter cracker crust. The hardest ingredient to find in Egypt for this are the Ritz crackers. You can usually find these in several of the bigger grocery stores in Egypt. But sometimes they just aren't there when you need them. I'll keep my fingers crossed for now. Green beans. Green beans serve a single purpose in my Thanksgiving meal. We Americans love our casseroles at Thanksgiving but I know from experience that some people (like my poor husband) don't want to eat all casseroles as side dishes. So I usually stir fry a bunch of green beans up with sauteed onions. Fast, simple, effective. Dessert. As much as I love sweets, I have so much trouble making a decision on what to make for dessert at Thanksgiving. I am partial to pecan pie myself, although finding pecans and corn syrup present a bit of a problem in Egypt. Plus there's that *small* problem of making a homemade pie crust. Unfortunately I'm not a big fan of pumpkin pie unless someone else brings it. I'm actually leaning towards making some sort of apple crumble this year. I tried making one a couple of months ago, and I think some sliced apples and a crispy oat crust topped with some vanilla ice cream just might hit the spot. So I guess you can see that I'm looking forward to Thanksgiving this year.